Pimco CEO Mohamed El-Erian, who has been with the investment firm for most of the last 15 years, is leaving in March. 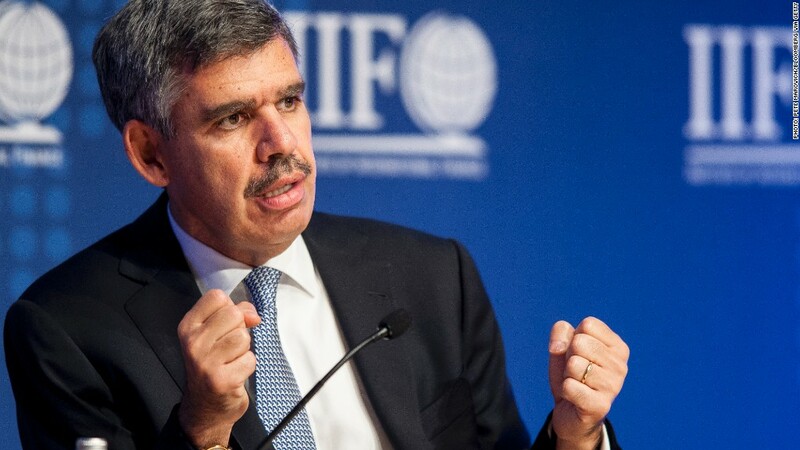 Pimco CEO Mohamed El-Erian is leaving the investment firm after six years in the top spot. His resignation will be effective mid-March. El-Erian has also been co-chief investment officer and the face of Pimco along with the firm's founder, bond king Bill Gross. Gross will remain as chief investment officer when El-Erian steps down. "Mohamed has been a great leader, business builder and thought leader for Pimco and our clients," Gross said in a statement. "Together we have guided the firm and served our clients during a period of significant change in the global economy and financial markets." And on Twitter, Gross, who is turning 70 in April, assured investors he's not going anywhere. "PIMCO's fully engaged," he said from the firm's Twitter handle. "Batteries 110% charged. I'm ready to go for another 40 years!" In fact, as recently as 2012, Gross told The New York Times, "Mohamed is my heir apparent." Pimco nor El-Erian provided a reason for the resignation, and neither were immediately available for additional comments. Newport Beach-based Pimco is the largest bond-fund manager in the world, with nearly $2 trillion in assets under management. Up until late last year, the firm's flagship Pimco's Total Return Fund (PTTRX) was the largest mutual fund in the world. But the fund lost over $41 billion in 2013 as investors dumped bonds amid rising interest rates. Still, both Gross and El-Erian are among the most influential players on Wall Street, with investors around the world listening for their views on financial markets and the economy. El-Erian, 55, first joined Pimco in 1999 as a member of the portfolio management and investment strategy teams. He left for two years to manage Harvard University's endowment and other investment accounts, before returning to Pimco in 2007. Prior to Pimco, El-Erian was at Salomon Smith Barney/Citigroup and spent 15 years at the International Monetary Fund. He will remain with Allianz, Pimco's parent company, on the firm's international executive committee and as an adviser to the board on global economic and policy issues. With El-Erian's looming exit, Douglas Hodge, who has been with Pimco for 25 years and is currently Chief Operating Officer, will become CEO. Pimco is also beefing up its portfolio management. Andrew Balls, who currently leads Pimco's European investment team, and Daniel Ivascyn, who heads up the firm's mortgage credit portfolio management team, will both transition to deputy chief investment officer roles.